Venture Out can now offer First Aid staff for your event. Our staff will come to your event and provide trained staff and basic first aid supplies. This service is perfect for races, large fundraisers and other outdoor events. We have staffed First Aid tents for local marathons and 5Ks, Boy Scout events, and PHA Bid Day. 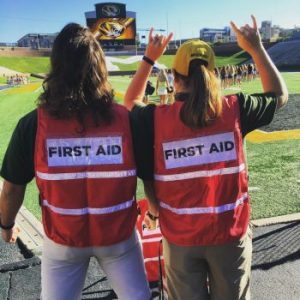 To request First Aid staff for your next event, contact us at ventureout@missouri.edu.